Despite being in my 30s, makeup is something that is still a bit of a mystery to me. I wear it everyday when I go out and about, but haven't mastered any looks outside of the natural, everyday look and dramatic eyes for parties and special occasions. In looking back I think my limited experience with makeup comes from my upbringing. The women in my family that I spent most of my time around didn't wear a lot of makeup. I also didn't have lots of opportunities to play with makeup as a little girl and wasn't allowed to wear makeup until a few years into high school. 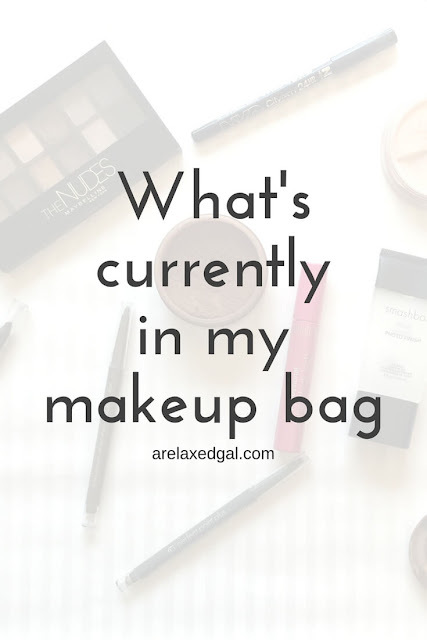 With that being said, when I started to get ready to do this makeup bag post I was surprised how much makeup I had in my makeup bag. I was turned onto the Smashbox Photo Finish Oil Free Foundation Primer by a Sephora associate several years ago and have been using it ever since. Before that day in Sephora I had never heard of Foundation primer and if I had I never would have thought it necessary. Now I think it's a must for creating a flawless look. The Smashbox Foundation Primer goes on smoothly, doesn't feel greasy or make my skin feel oily or breakout. I've got a full review that you can read here. I was turned onto mineral foundation after seeing one of those Saturday morning infomercials so when I heard about Mary Kay's Mineral Powder Foundation I had to try it out. It didn't hurt that one of the benefits of using Mary Kay is you have an associate who can help you find the shade that best matches your skin tone. 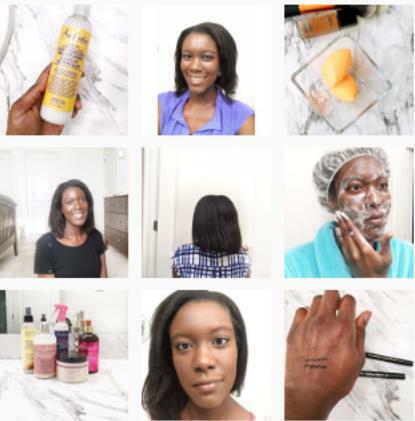 I wear this foundation about six days a week for eight+ hours and I don't have skin irritation or breakouts. 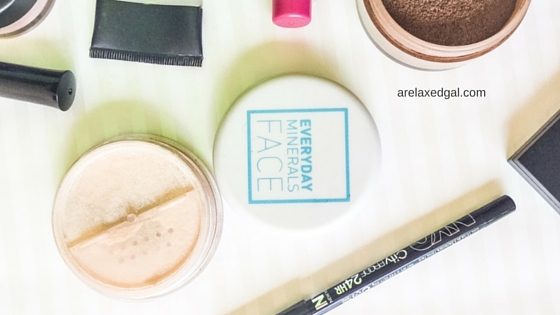 Everyday Minerals was a mineral makeup brand I used to purchase my foundation from several years ago, but now I only purchase my finishing powder. I love that it's translucent so I don't have a ghostly look and it gives me a nice matte finish. I brought this a whim and really only use it when I feel like wearing blush, are dressing up for something special. So I don't use it much. The pigment is really nice, but not overpowering so it gives my cheeks a nice tint without being obvious. I saw a makeup tutorial on YouTube that used the E.L.F. 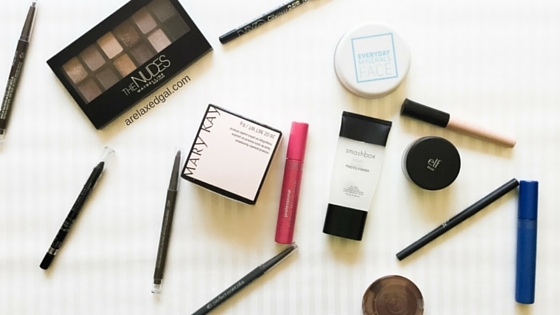 Cosmetics Eyelid Primer and talked about why you should use a primer for your eyes. Since this primer is only a few dollars and one tube lasts forever I gave it try and have found it does help my eyeshadow stay in place and not crease. In my 20s I would wear colorful eyeshadows all the time, at work, going out, to church, you name it. Once I got in my 30s I decided to tone it down and started wearing more neutral colors. 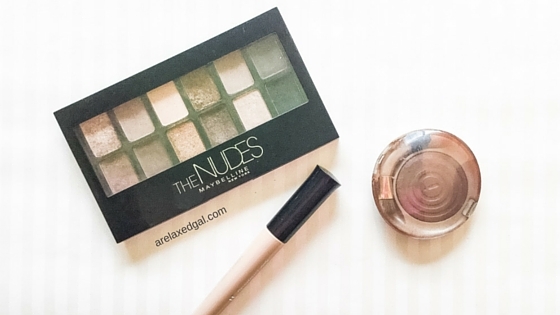 Hence the Maybelline The Nudes Eye Shadow Palette ending up in my makeup bag. I bought this Milani Cosmetics Baked Eye Shadow because I liked the color which is called Coffee Shop. I also thought the color would mix really well with the neutrals I tend to wear without being too obvious. CoverGirl is my go-to for mascara. Within the CoverGirl brand, I buy whichever waterproof mascara is on sale. 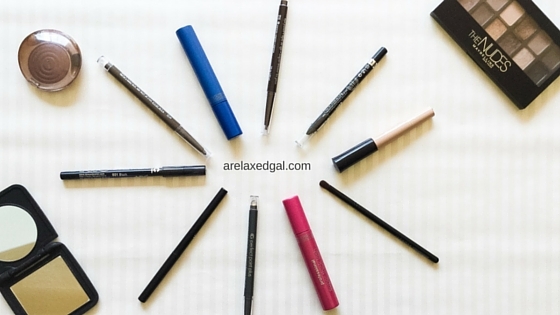 Until I started working on this post I had no idea how many eyeliners I have. There's an E.L.F Cosmetics liner in purple; NYC CityProof liner in black (this was a freebie); Rimmel Scandaleyes (another freebie) in black; and CoverGirl Point Plus Eyeliner in charcoal, grey khaki and expresso. My favorite of all of them is the CoverGirl Point Plus liner. You can read my full review here. I don't have much in my bag. I love my Mac powder plus foundation, heroine lipstick, their concealer, and my L'OREAL Paris eyeliner. I think you got more stuff in your bag than I do. When I started taking inventory I was surprised how much make up I have! I even threw a few things away that I've had for a while and shouldn't be using anymore. I've heard good things about Mac makeup but haven't tried it yet. What do you like about the foundation?